But besides concocting different flavor combinations, I’m not sure that ice cream can be an ever-lasting learning journey for me like pastry can be. I am always stunned about something pastry-related that is new to me—I’m always learning—but I’m not sure there’s much left for me to learn in the realm of home ice cream making. I know the camps: team custard-based, team cornstarch, team cream cheese, team corn syrup, team sweetened condensed milk, team stretchy, team icy, team vegan. And once you figure out what camp you’re in, you can create whatever you want with little heavy thinking. So here’s my attempt to make pastry and ice cream collide. Preparing three things I know how to make well but packaging them a little differently, architecting what I hope is a thoughtful, elegant, and somewhat unique embodiment of a childish joy. How thin should the cake be and in what vessel should it be baked? How thick should the ice cream layer be and should it contain any mix-ins? How should I apply the ganache topping? If I pour or spread it over top will it simply seize when it hits the frozen mass? Yes, it took architecting. 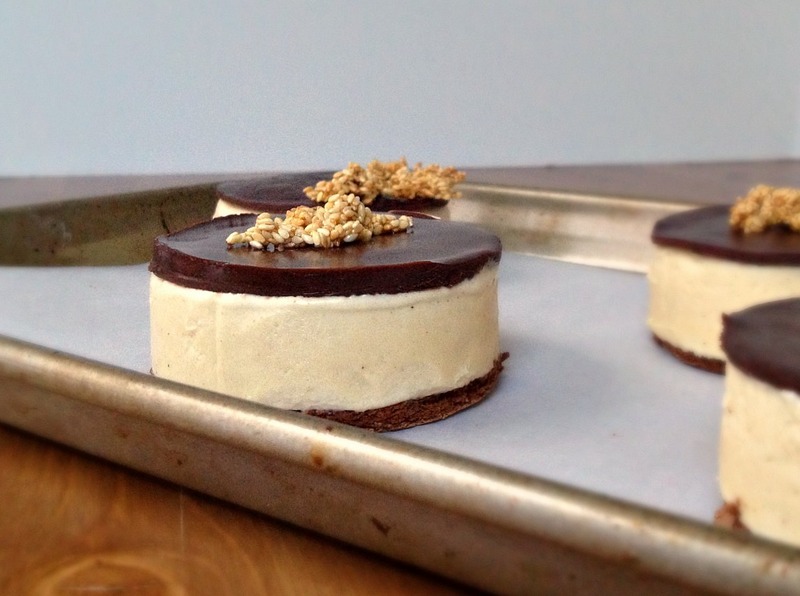 These individual cakes feature one of my favorite pairings: chocolate and tahini. If at first the combination seems unnatural, think peanut butter and chocolate with a slightly more bitter, savory edge. Tahini and chocolate have for a long time lived together in bars of chocolate draped or cocoa-flavored halva, the Middle Eastern treat that I’ve always adored but sometimes found too sweet. Here the sweetness is in check. And though I’ve painted bananas with tahini as if it were peanut butter for many years (I adore that pairing and have made a banana ice cream with tahini caramel swirl—that should be my next post! ), and eaten plenty of shortbread-like tahini-based cookies, I hadn’t thought too much about incorporating tahini into non-savory items until 2010 when I went to a pastry chef demo, featuring, among other talents, Maura Kilpatrick of Oleana (remember the chicken?) and Sofra that I learned just how versatile tahini is in sweets. Maura made (and we happily tasted) sugar-coated tahini brioche donuts (!) (tahini was actually substituted for butter); tahini cups (a no brainer) that were all sorts of complex beyond the normal sweet, salty, nutty that Reese’s made famous; and, of course, tahini shortbread. There also used to be a killer tahini hot chocolate served at Sofra—I hope they still make it. Since that evening, I’ve put tahini to work and, of course, needed to try an ice cream flavored solely by my favorite seed butter. I like tahini with a bitter but not too bittersweet chocolate; it’s bitterness brings out the similarly strong flavor of tahini yet too much of it would overshadow the tahini’s flavor. Sandwiched between a thin layer of flourless chocolate cake—in my opinion the best base for ice cream cake given that it stays fudgy yet cakelike in its frozen state—and a thin layer of shiny chocolate ganache is a miraculously creamy, subtly sweet ice cream flavored deeply with tahini but not to the point that it is heavy or mouth-coating—it retains a clean dairy flavor. 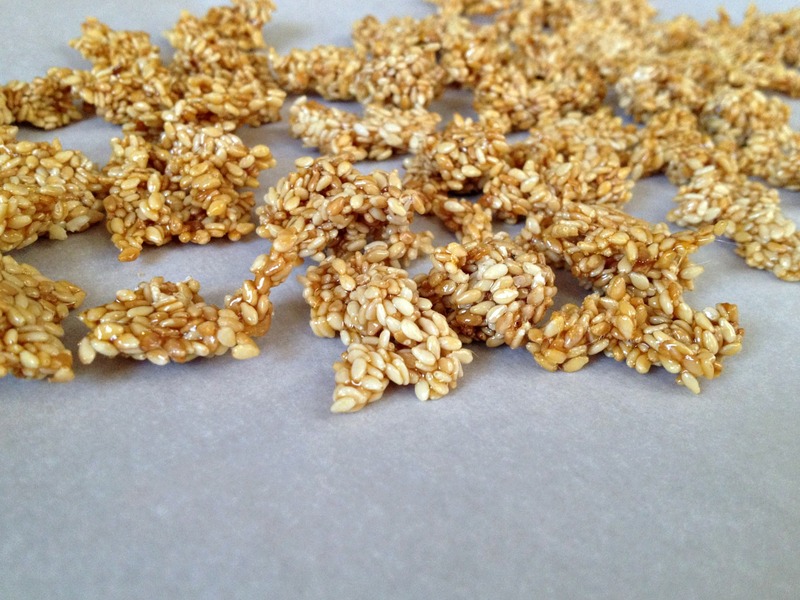 Honey sesame clusters on top add texture, toasty warmth, a flavor reminiscent of halva, and a familiar taste of the sesame candy popular throughout the Middle East and Asia. They also make the cakes look like jewelry boxes. 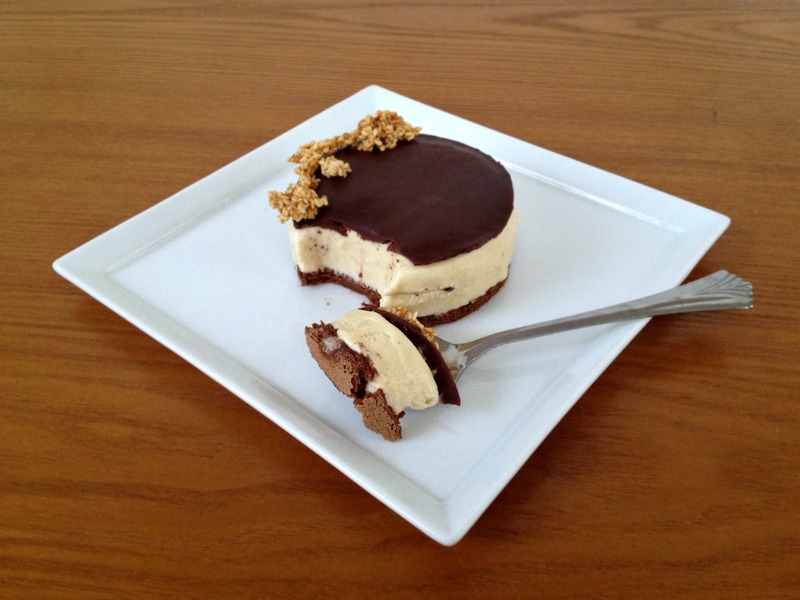 This, my friends, is my ideal dessert. A dessert playful enough to remind me simultaneously of summer days spent twirling my tongue around peanut butter and chocolate ice cream on sugar cones, friends’ Carvel birthday cakes, trips to Toscanini’s, and spoons of warm brownie sundaes. This one dessert tastes like all of those things. All of these recipes will yield scraps once the correct-size rounds are punched out. Feel free to make adorable mini cakes with tiny cutters, mash the leftover components together into a sundae, or just pick at them as you go—you deserve it. This recipe is long as there are four separate components. Though each component is simple to make, the whole process can be time consuming and you should plan in advance, starting a day or two before you pan to serve the cakes. It’s worth it, I promise! 1. Lightly grease 3 1/4-inch (or similar size) round cutter. Line small baking sheet with parchment paper. Cut 4 rounds from frozen Flourless Chocolate Cake and transfer, crispy top side down, to prepared sheet. 2. Clean and lightly grease same cutter. Punch round out of Tahini ice cream, line up with cake circle and press from cutter using back of spoon. Repeat three times with remaining ice cream and transfer cakes to freezer for at least 45 minutes before proceeding. 3. Cut a 5- by 5-inch square of wax paper (do not grease). Clean and grease cutter same and cut out 1 ganache circle. Peel off and discard unwanted border of ganache. Place wax paper square over ganache round and flip. Carefully peel off original wax paper square, place ganache round on top of ice cream round, and carefully peel back second wax paper square. 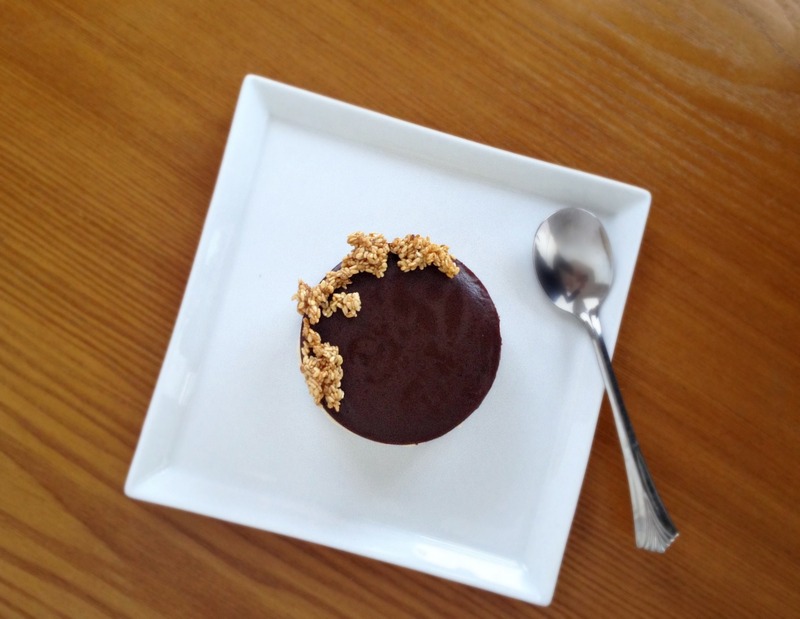 Press sesame clusters into ganache to garnish cakes. 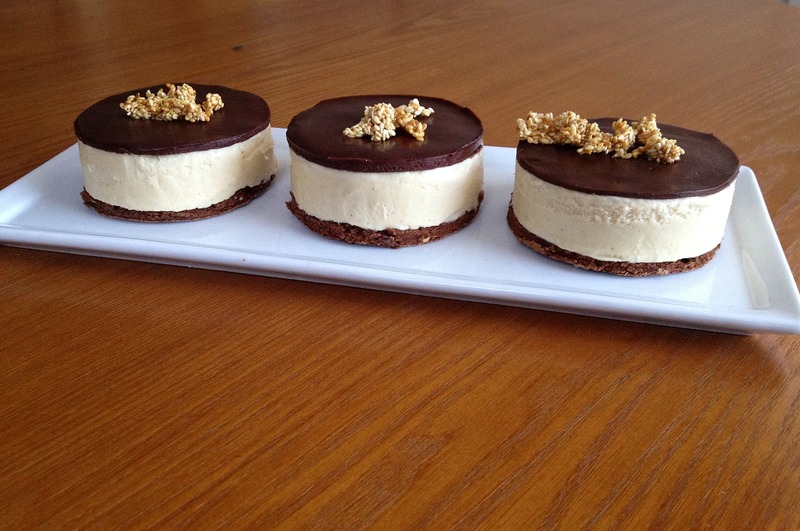 Repeat with remaining ice cream cakes, keeping them in freezer until ready to use. Freeze finished cakes for 30 minutes before serving. 1. Whisk 115 grams (½ cup) milk, 115 grams (½ cup) cream, tahini, and vanilla in medium bowl until homogeneous. Place fine-mesh strainer on top of bowl. 2. Bring sugar, salt, remaining 230 grams (1 cup) milk, and remaining 230 grams (1 cup) cream just to boil in small saucepan over medium heat. Meanwhile, whisk egg yolks together in medium bowl. Set up ice bath in large bowl. Pour small amount of hot milk mixture into egg yolks, whisking constantly, to temper, then slowly whisk in remaining cream mixture in steady stream. Transfer milk-egg mixture to saucepan and cook, whisking constantly, over medium heat until line drawn down custard-coated spoon holds and custard registers 170-175 degrees. Pour custard through fine-mesh strainer into tahini mixture and whisk to combine. Transfer bowl to ice bath and whisk occasionally until mixture reaches room temperature. Cover bowl with plastic wrap, transfer to refrigerator, and let chill for at least 8 hours or up to 24 hours. You can grease the sides of the pan and the top of the parchment with butter, but grease the very bottom of the pan lightly with oil or oil spray; if you use butter, it will resolidify when it’s time to invert and the cake will not release from the pan (in one piece, anyway). Note that this is not a factor with a springform pan. I used a stand mixer (reflected below) but the egg whites can also be beaten to stiff peaks with a hand-held mixer. 1. Adjust oven rack to middle position and heat oven to 350 degrees. Lightly grease 9-inch cake or springform pan and line bottom with round of parchment (see note). Lightly grease parchment. 2. Place chocolate in medium bowl and set over saucepan containing about an inch of barely simmering water. Stir chocolate occasionally until melted. Remove bowl from saucepan and let cool for 2 minutes (no longer). Whisk egg yolks, water, and salt into chocolate until combined. 3. Using stand mixer fitted with whisk, beat egg whites on medium speed until soft peaks form. Gradually add sugar on medium (this should take about 30 seconds). When all sugar is added, increase speed to medium-high and beat whites to glossy stiff peaks. Fold one-third of whites into chocolate mixture to lighten. Fold remaining whites into chocolate mixture until no streaks remain. Pour batter into pan and smooth top with small offset spatula. Bake until top feels set and crisp, sides begin to pull away from pan, and a toothpick inserted in center comes out clean, 12 to 18 minutes, rotating pan halfway through baking. Transfer cake to wire rack and run knife between sides of cake and pan. Let cake cool in pan for 10 minutes, invert onto wire rack and peel off parchment. Slip another parchment round under cake and let cool completely on rack. When cool, transfer cake and parchment to baking sheet, cover with aluminum foil, and freeze for at least 1 hour before cutting. I try to turn to corn syrup as little as possible, but here it is important to keep the ganache from becoming dull-looking. For desserts that are not frozen, a bit of butter can achieve this, but a frozen butter-enriched ganache would not be malleable enough. Although you can use parchment, I found wax paper to better release the rounds. Grease 3 1/4-inch (or similar size) round cutter with oil. Cut out six 5- by 5-inch squares of wax paper. Lightly grease wax paper squares and place on small baking sheet. Place chocolate, corn syrup, and salt in bowl. Bring heavy cream just to boil and pour over chocolate; let sit for 30 seconds, then stir to combine and fully melt chocolate. Keep ganache warm over saucepan containing an inch of water, turning heat on if ganache starts to set up (stir ganache until it is fully fluid again between uses). Place cutter in center of 1 square of wax paper. Pour heaping 2 tablespoons warm ganache into cutter and move baking sheet as needed to spread ganache in even layer inside cutter. Lift cutter slightly off wax paper to let about 1/8 inch of chocolate ooze out and immediately press it back down. Transfer sheet to freezer for 1 to 2 minutes then take out of freezer and remove cutter. Round should hold its shape for the most part. Wipe cutter clean, regrease, and repeat with remaining wax paper squares. When all rounds have been made, transfer them to freezer for at least 1 hour before cutting. 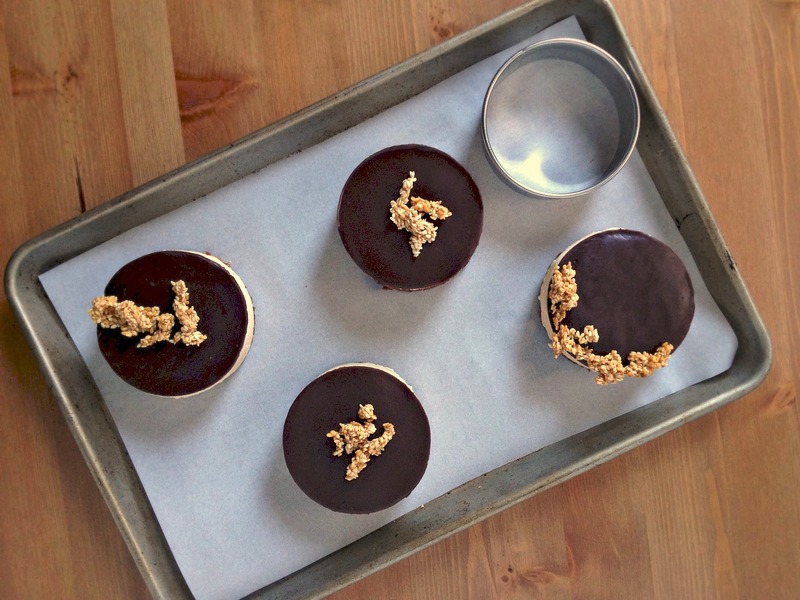 I take back everything bad I ever said about ice cream sandwiches. Sacha, these are beautiful! I love ice cream all year round, too.